I just placed my order. Excited about getting the book. Yippee!! 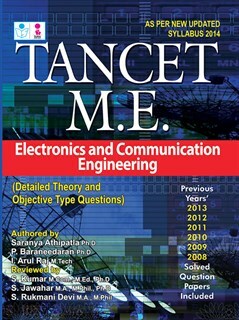 Do you have a similar book for EEE as well? I`m in need of the Electircal book for TANCET. The delivery is good. I got my book delivered in just 2 days. Stupendous! Rs 150 per book is worth it! I initially doubted if this new publications will be good, but my doubt is 100% cleared with the impeccable quality I notice in Sura books` quality. Awesome! It`s my dream to get through the Tamil Nadu Common Entrance Test. This book is promising to help me clear it. Thanks a ton!